The Petersen Split Squat is named after Canadian Physiotherapist Carl Petersen who traveled with the Canadian Alpine Ski National Team for 15 years and became known for using various exercises variations – most famously the Petersen Stepup – to strengthen the Vastus medialis and that way increase knee stability dramatically which led to a decrease in the very common knee injuries in Alpine SkiingDue to the ratio of concentric to eccentric overload the Petersen Split Squat is not an exercise that will strengten or hypertrophy the Vastus Medialis much. Its a exercise that is excellent to activate the fibers of the Vastus medialis. Which will combined with an exercise group like the squat that overloads the Vastus medialis in the eccentric over a great range, lead to a stronger and bigger Vastus medialis. 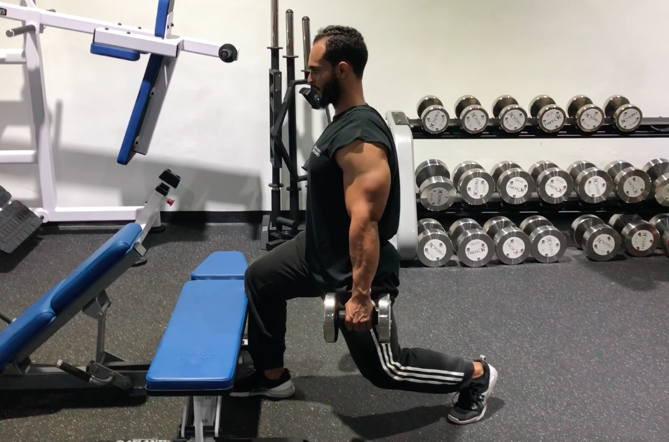 The Petersen Split Squat is a excellent exercise to put in the beginning of the leg workout for 2 to 4 sets of 6 to 15 reps at a fairly fast tempo for the intermediate to advanced lifter to activate the Vastus medialis. With executing the Petersen Split Squat the primary objective is to contract the Vastus medialis in the terminal extension of the knee to activate the Vastus medialis. The better you feel the muscle from rep to rep, and set to set, the better this exercise did its job.